Woodland’s Cydney McPeak sets up for a jumper against West Side. McPeak scored 22 points to lead No. 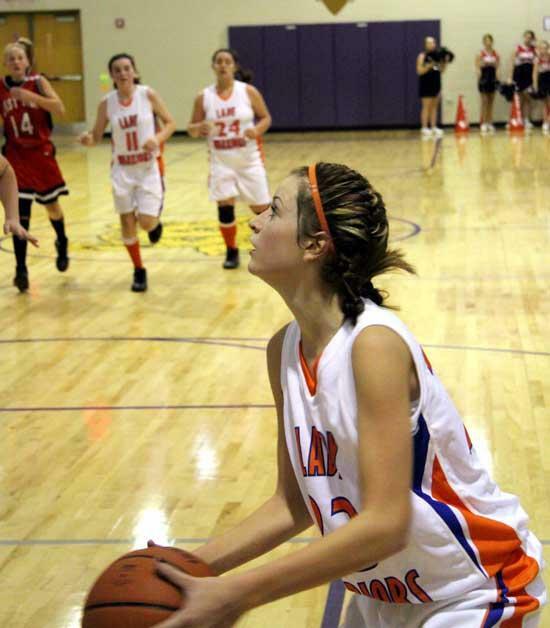 2 seed Woodland to a 38-28 win in the semifinals of the 2010 Cannon County Cancer Tournament Thursday. Players on the Auburn girls basketball team took coach Tim Reed's words to heart. The top-seeded and undefeated Lady Knights stormed out to a 9-2 first-quarter lead and stretched the margin to 19-3 at the half. They never looked back in a 33-10 win against Woodbury Grammar to reach the championship game of the 2010 Cannon County Cancer Tournament against No. 2 seed Woodland Saturday. "I tell the girls they have to get up for every game because they have a bulls-eye on their back now," Reed said. "They have to bring their 'A' game every time out. We wanted to get off to a good start and we were able to do that." Erin McReynolds led Auburn with 15 points, followed by Kristen McReynolds with 12. Alayna Reed (4) and Cheyenne Fann (2) also factored in the scoring for Auburn (12-0). Kaylee Hayes led Woodbury Grammar with three points. Emily Sissom, Ashley McVay and Lexie Estes tallied two each. Auburn's stifling defense, along with its ability to control the boards, contributed to its dominant showing. The Cubs were held to one field goal into the third quarter. "The girls play excellent defense," Reed said. "I don't worry about the other team scoring. I worry more about our offense." The Knights' defense was their best offense against Woodbury Grammar as numerous turnovers led to easy layups. Cydney McPeak scored 22 points to lead No. 2 Woodland (9-2) to a 38-28 win against West Side in the second semifinal Thursday. Woodland took control of the contest out of the gate with a strong 15-4 start. The Lady Warriors rode the wave of the hot start the rest of the way. Though they never pulled away, the Lady Warriors always seemed poised and in control. "I told the girls the tournament is different and you can't base things on results during the season," Woodland coach Suzette Sissom said. "It is a different atmosphere and a different floor. You have to bre ready every game and you can never underestimate your opponent." Woodland left little to chance against West Side, which was led by Kendra Maynard's 14 points. McKenzie Adams added five and Sarah Hickman finished with four for West Side, which will face Woodbury Grammar in the girls consolation Saturday at 4 p.m. The Lady Warriors were tough defensively and dominated the rebounding category. Ariana Kaliponi was a vital cog in the victory with nine rebounds and eight assists. "(Kaliponi's) rebounding and assists were a big key in our win," Sissom said. "She really stepped up for us and Cydney had the hot hand shooting. Her early shots really got us going." Hannah Faulkner, Hope Tenpenny and Kelli Payne each scored four in Woodland's win. TAKE IT ALL THE WAY AUBURN GIRLS!!!!! We are so proud of you!!! LETS GO LADIES! CONGRATULATIONS ON A WONDERFUL SEASON SO FAR! Yeah!!! Way to go Auburn Gilrs!!! And Auburn Cheerleaders looked very fantastic and very "CHEERY"